Bora Bora popularized the concept of over water villas, the perfect magic of sleeping over the beautiful waters of the Pacific with the waves gently crashing on your deck. What better place for your honeymoon. And that is practically the only type of traveler who makes it all the way to the South Pacific. 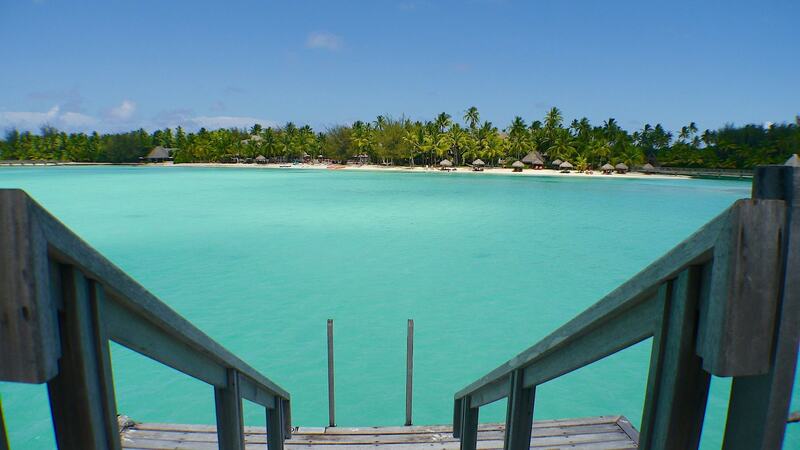 The Tourism Board confirmed that 90% of the visitors come to Bora Bora for their honeymoon. Romance is in the air, on the tables set for two, the photography packages, the sunset dinners by the water and the dreams come true. For all the mortals out there like me who had never come to Bora Bora the lagoon island had also managed to build up expectations. Very strong ones. In the same way as other unapologetically romantic destinations exclusive to those celebrating a once in a lifetime moment, the word Bora Bora eludes to endless sunsets, tropical cocktails, warm waters and love. And of course, an unlimited supply of luxury, plain old school luxury. Like any other passionate explorer and devourer of travel magazines it felt like I had been waiting for my trip to Bora Bora ever since I first ever caught a glimpse of its lagoon. At times, I feared that having read and seen so much of it on glossy pages would make the whole experience feel like I had already been there, if only in my dreams. I was truly scared that after the money and the long way out there I would be wowed but disappointed. Unavoidably, throughout those years, I had build castles in my head and created unachievable expectations. Much like the dream of a lifetime love and a life filled with perfection I had imagined Bora Bora was going to be the ultimate trip, the one that would redefine my travel experiences. After over 80 countries and a decade on the road this was going to be the culmination of a life as an ultra-frequent traveler. A celebration of my love for the sun, sea and sand life. No destination, no trip, no company and no beauty could have ever matched my dreams because they were just that, unachievable dreams of a utopic place that only existed in my mind. Bora Bora came close to it but I had unknowingly set it out for failure. Before setting off I read an article on Conde Nast Traveler about a family who were doing just that: preparing, for an entire year, to embark on the trip of their lifetime, to Bora Bora, to celebrate the grandparents 75th birthday – they waited all their life for this trip. They snorkeled in the bathtub to practice their skills and they compared every aspect of day to day life with this magical place in their minds imagining that Bora Bora would be better. And in the end, they came back with some unforgettable memories but also with a bittersweet thought: even the most perfect of places will start to dissappoint you after the wow has worn off. He put it very nicely and you can feel the weariness and tiredness of realizing what the problem with paradise is. Read here for more details. My experience did not go like that. As a professional traveler and ex-consultant, I see the room for improvement on absolutely everything from day 1, isadvantages of the profession, but rest assured it never stops me from having an incredible time and from being mesmerized at the beauty there is in this world. My tale goes like this. I left Bora Bora in complete awe. I was speechless and humbled: it is a genuinely stunning part of this beautiful planet but, as with everything and everyone we idolize, I also felt its shortcomings and I did not have to justify my travel choice to anyone so I could be honest to myself and admit that, in some aspects, Bora Bora was just not there. Assuming that, like me, you also have an image in your head about what Bora Bora must look like, let me help you bring it down to Earth to a more realistic yet still magical place with these facts about Bora Bora that surprised me. But first, here’s some eye candy to get your barefoot luxe juices flowing. The magic of Bora Bora is not the over the top artificial luxury that you can recreate anywhere but in the raw luxury of being in an unspoiled, unique and exclusive part of the world few get to see.And of course, this is a spectacular place. The entire French Polynesia gets under 200,000 visitors a year. Compare this to Maldives’ over a million arrivals and you get the gist. Often times, luxury is not the best stocked up minibar, the panel which allows you to control the entire electronics in the room or the highest thread count bed sheets but the perfection of the beautiful moments you can’t explain. I was expecting a level of luxury the likes of destinations such as the Maldives have made popular. I was expecting the resorts in Bora Bora to try to outdo the competitors with the largest cellar, the most ratio of staff to guest, the most exclusive experience, the most expensive dinner, the deepest restaurant or the widest choice of ______ (read the most extraordinary item). Anything that would qualify as a world’s first. How wrong I was only dawned on me after the first couple of days. There is no over the top luxury here, no extraordinary gimmick and no trick of the hospitality industry. Bora Bora is the pearl of the Pacific, a land of incomparable beauty that cannot be explained and should also not be tampered with. Over the top luxury is required when you need to improve the underlying raw material but when you have the highest grade diamond you don’t need to polish it any further. Island resorts around the world have led the way in providing the urban levels of service in the most remote parts of the world. There is no such thing as “island time” anymore and resorts pride themselves on making sure they provide world-class service even in the farthest of places. Some properties try to recreate the true island time philosophy through a no-shoes, no-watch, no-news motto to try to bring the peace that comes with simply taking things in and being in the moment. I am looking at the Six Senses or Soneva Fushi properties for example. 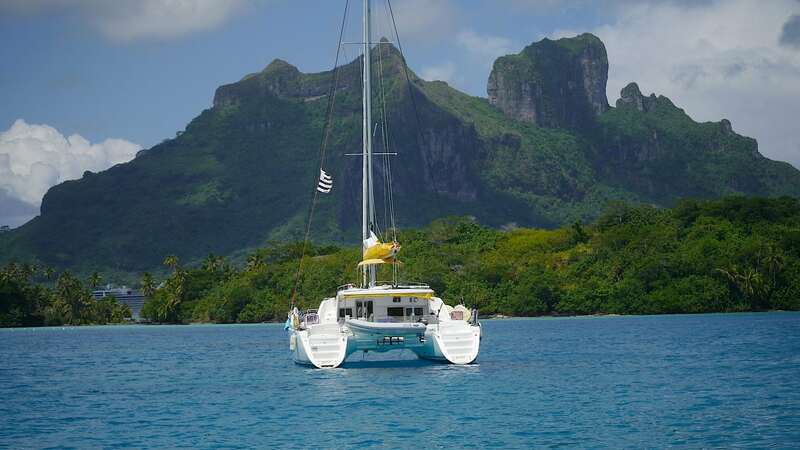 Bora Bora is laid back, perhaps to the point of annoyance, and if you are on a tight schedule or are trying to bring your rat race mentality over you will be disappointed. In Bora Bora things happen when they happen, just like they used to before, and no matter how much you paid for your room service will remain correct but nothing to write home about. At least not in the terms an urban dweller may define. You may even feel frustrated and looked down upon. Perhaps you may even have to chase the Concierge to get things done. Relax and get into the mood. The sooner you do that, the sooner you will start enjoying the magic of immersing yourself in the beauty of the surroundings. I had high expectations about the appearance and the beauty of Bora Bora, after all, I have been to numerous island destinations many of which I thought were the nicest I have ever seen until I visited the next one. In the Pacific alone I stepped on the finest of sands, swam in the clearest of waters, sailed through the entire blue Pantone range. I thought I had seen it all. Bora Bora managed to exceed all of the above and, for 8 days, charmed me every morning into thinking it was getting prettier. I still think it did. I could not get tired of staring at the lagoon, of cruising around the warm waters staring at the horizon, climbing up to a lookout point to take it all from above. Bora Bora will remain one of the most perfect places I will ever see and now, I am convinced it will remain on that list no matter how many other islands I dip my toes into. This is something I could not have fathomed. Given its romantic and honeymoon par-excellence status I had expected Bora Bora to master the art of privacy. After all, couples go there in search of private romantic time. Nowadays all high-end resorts with private villas will ensure that guests have complete privacy. Resort properties from chains such as Aman Resorts, Six Senses, Soneva Kiri, One & Only and alike all pride themselves in making sure that you never see another guest while in the privacy of your own villa. This trend was not there when the resorts on Bora Bora were constructed and it is a problem impossible to solve a posteriori. The result? From your deck, and even from your bed, you can see and be seen by other guests. I could have noticed this from the photos as it is obvious when you look at the distribution and maps but I had just assumed privacy would be a strong point not a strange one. As opposed to the Maldives or to private resorts on their own islands Bora Bora’s lagoon, where most over water villas are located, has high water traffic. Between the shuttle boats and the tour operators there are boats passing by the villas regularly. Additionally, over water villas are not positioned or designed to provide full privacy so you can easily spot your neighbors from your deck. Moreover, the villa’s windows are not reflective instead providing full views into the guest rooms. I was very surprised to find out that on Bora Bora you can, and should do, a lot of activities and excursions around the lagoon and the main island. There is culture to absorb, nature to explore and marine life to immerse yourself into. Bora Bora is not just a beach destination but a much more rounded vacation where you can interact with the 9,000 Polynesian inhabiting the island. If you want to read more about what to do check out my article on 13 things to do in Bora Bora here. Sadly, I did not get to see the dark sky nights I was expecting. Despite being a remote location in the middle of the Pacific the island and resorts have too much light pollution for the starry night to reveal itself. Surprising but true. The sunsets on the other hand, are extremely beautiful and they last for over 2h so plenty of time to enjoy the Happy Hour!